Saturday before Easter and I wanted to go riding. I was supposed to stay home and be a good son-in-law, as my wife's mother was here for the weekend. Nah! I'm going riding. As many as six of us said they'd show up at the staging point to go riding, but as it turned out, only two of us did. One guy got reprimanded by his wife for having ridden too much already the past several months. He had to stay home. Two others were no shows. Not sure what happened. The last guy said that it was too cold to ride. It was 53° when he said this, with an expected high of 69° in the afternoon, and that's too cold to ride? The two of us that showed up talked about where to ride. He said he didn't care, anywhere was good. He just wanted to ride. That sounded cool to me. So when it's cold and cloudy, where do you ride to? The mountains of course! As we headed out, there was heavy mist in the air, but no rain. The road was wet where we started out. Water droplets collecting on my windshield had grown to such a point that it was difficult for me to judge the curves ahead. I had to pull over and wipe them off. We went up Highway 371 into Anza, and found warmer temperatures and SUNSHINE! Basically, we had risen above the cloud cover. We also found many more bikers. It seems they made the same call as I. We made the climb up the mountains to Paradise Corners, right at the junction of Highway 371 and 74, and continued to find bikers everywhere, and still sunshine. Then we rode highway 74 down into Palm Desert, and it got so warm, that we had to pull over and take off our jackets. We had to put on sun screen too. From there, we hopped on to Interstate 10 and headed west towards Highway 62. Oh man! The head wind was blowing like heck. This was the usual head wind you get when riding through Palm Springs, except it was a little more fierce than usual. The upper and lower fairing on my Ultra Classic acted like a sail, catching all the wind and slowing me down to about 70mph at full throttle, in top gear. I bumped it down to 4th, and tried to get myself up to 75mph. We jumped on Highway 62 heading north. At this point, the wind was hitting us from the side. At times we were angled over at 45° riding straight ahead. We finally got to the hills and were free of the wind. We rolled into Pioneertown, and found the place packed with motorcycles. I never saw so many bikes at Pioneertown before. Some kind of "biker band" was playing, and just about every biker in Yucca Valley was there. 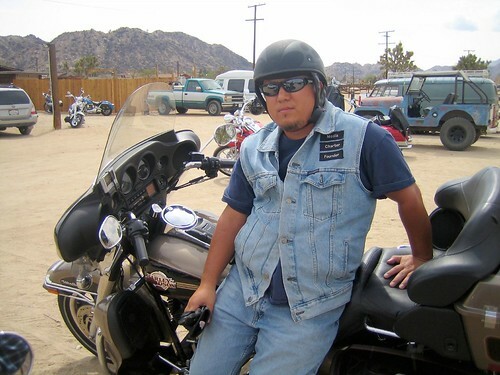 On Easter Saturday, this is where bikers go: Pioneertown. We bellied up the to bar and had us some drinks and chow while we chatted away for a couple of hours trying to talk over the band. All in all I had a great time riding and hanging out. Moral of this story: When the weather is cold and cloudy in your neighborhood, get on your bike and go find great weather. Riders go riding not just to enjoy good weather, but to seek it out!